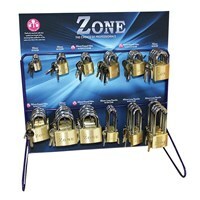 Counter Top Display metal frame stand comes with x24 Zone 10 Series Marine Padlocks (2 per hook). 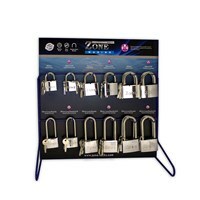 Counter Top Display metal frame stand comes with x48 Zone 10 Series Marine Padlocks (4 per hook). 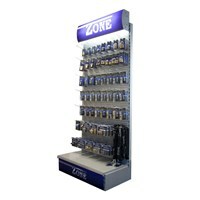 Standing at over 2 metres and featuring an illuminated header, the silver backdrop accentuates the royal blue Zone packaging creating a professional and striking display that is suited to any retail environment.